The stage arrangement in Krakow’s ICE Congress Hall made clear that this would be no ordinary Passion performance. 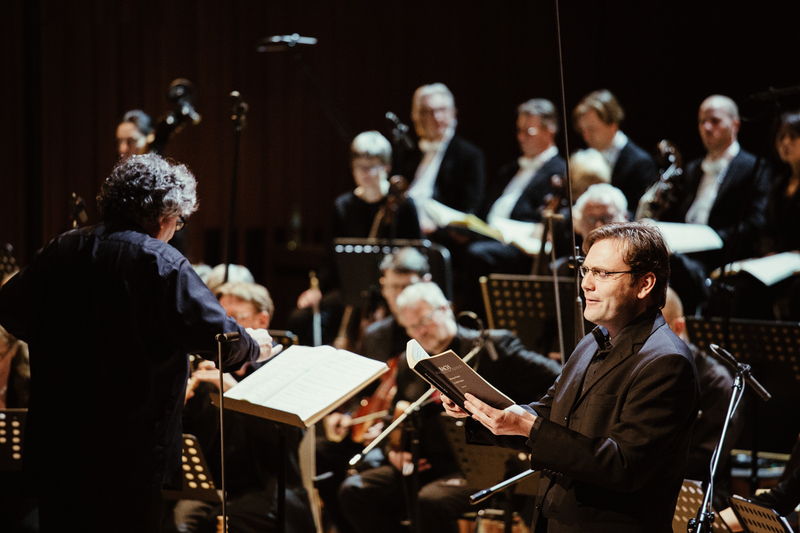 As if one was to be expected from René Jacobs, who consigned the second orchestra and chorus of the St Matthew Passion to an echo gallery in his 2013 recording. The picture tells most of the story, but not all. In their recording scheduled for later this year, the harmonia mundi engineers may capture the spatial dimensions of what we saw in greater detail than we could hear. The soloists stand within the main ‘turba’ chorus to the right. The supplementary chorus (also drawn from the RIAS Chamber Choir) ranged across the back contributes not only to the chorales but as a rank of extra force when required; in the three opening pleas of ‘Herr’, for example. When the texture recedes to part-by-part contrapuntal cries of ‘Herr, unser Herrscher’, these are assigned to the soloists. Thus neither singers nor instrumentalists are called upon to play with much dynamic variation. Contrasts of scale and volume are achieved by deploying more or fewer musicians, just as a harpsichordist depresses keys. 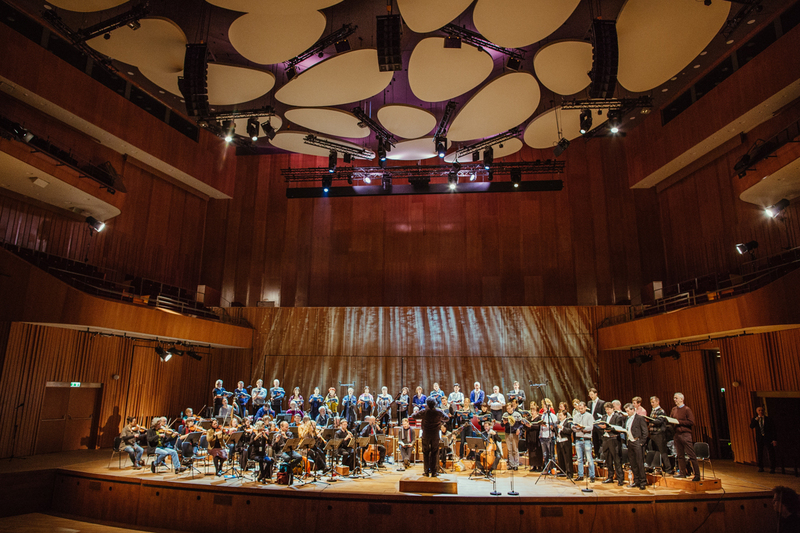 This isn’t a new approach – Christopher Hogwood made his music that way – but it is unusual in a work usually assessed in performance by its fidelity to various traditions of dramatic presentation, of which Karl Richter and Peter Sellars/Sir Simon Rattle might be taken as two extremes. True to form, Jacobs creates his own. Think of the musicians not as singers and instrumentalists but ranks and pipes and stops of a super-organ, exhibiting no dominating personality in themselves but each a vital member of the ensemble, and the form and sound of this particular Passion takes shape. 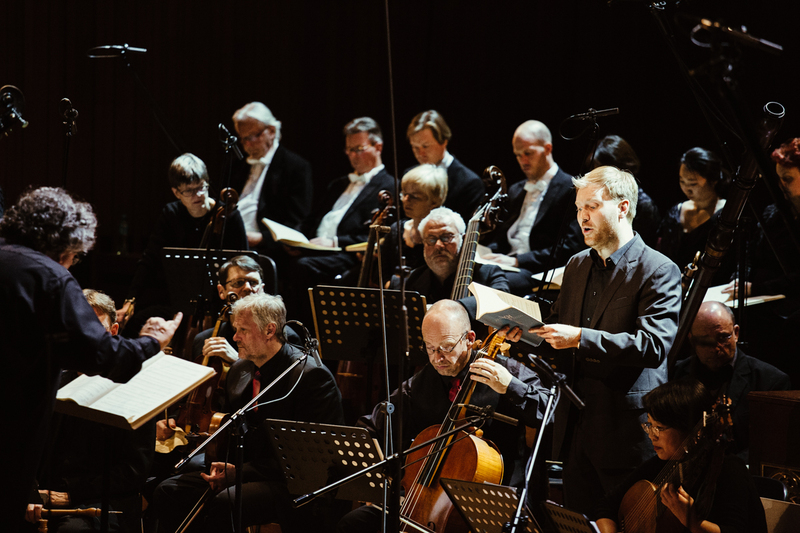 At the centre – in the solo spotlight of a Greek chorus – stands Sebastian Kohlhepp, the Evangelist as a dryly observant narrator, not the first person of Mark Padmore, and if his words keep the pulse of the story going, it is in the four-strong continuo group behind him that we find the guts of the piece. Organ, ‘bassono grosso’ (as requested on the first page of Bach’s manuscript, and this bassono towered over its player, Christian Beuse), cello and lute are whirled in kaleidoscopic combination: the usual concept of ‘realisation’ hardly begins to do justice to what Jacobs has created from the suggestive notes and figures of the score. He got full value from the gambist Juan Manuel Quintana as part of a subsidiary continuo group alongside a pair of first violins, string bass and that busy lutenist, Shizuko Noiri, all bringing a more fragile and shifting texture than the usual, steady halo of strings to accompany the words of Christ. Not that he has invented (much) more than fragile connective tissue between numbers, or most conspicuously a brief organ improvisation before the second part with some unlikely chromatic progressions, but they offer much more than support. Spread chords on cello and lute between the philosophical dialogues of Christ and Pilate, a gamba line hung out to dry on the Cross, the savage rip of the organ’s chord to tear the curtain in two: here is where the drama lies. So richly elaborated was this continuo, it was not obvious (to me) whether we were hearing Bach’s original 1725 score or his elaborated version of the first ten numbers from 1747. I’ve written in the present tense, even though this is a report of a single event, because although standards of presentation may vary in other concerts – the business of standing and sitting was distractingly uncertain – there’s something about the careful and original thought with which Jacobs brings a new production to the stage – operatic or otherwise – that a radical change seems unlikely. Jacobs himself is no platform animal, more like the organist at his bench. Mostly bent over the score like a watchmaker at his desk – in a work he has known since singing it as a child! 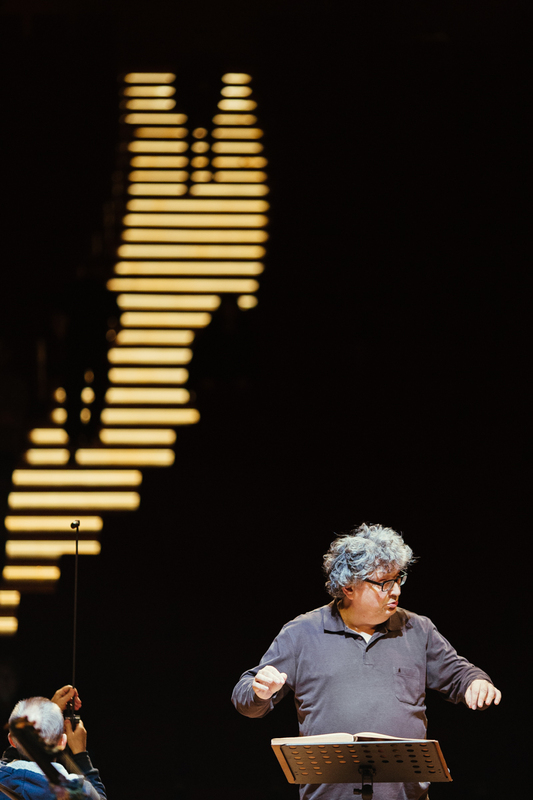 – he will occasionally look up to give cues to the choir but is otherwise absorbed by the mechanisms of his intricate continuo, while phrases and larger structures are left to tick over. Watching him beat the 3/4 of ‘Erwäge’ in 1, 2 (!) or 3 according to the movement of the bass is a disconcerting experience. After years of brisk and sleek, supposedly text-driven performances, it was a surprise to find the chorales sung with their (marked) fermatas at the end of each line. Not that I’m not pleased by their return, only amid the doctrinaire to and fro of ‘historically informed’ best practice, I was reminded of the Beethoven cycle recorded by Jos van Immerseel, who had concluded that, after much intensive research of his own, that the best, most ‘authentic’ pitch at which to play the symphonies was good old A = 440. What goes around, comes around. Most of the arias were unusually quick, even for the standards of our time, sometimes better suited to the obligato instrumental soloists than the singers. The tenor Martin Lattke almost danced his way through the scourging aria, ‘Erwage’, at a tempo testing for everyone except the audience, and the rainbows of the aria’s B section were submerged by the semiquaver figuration of its floods of sin. In both her arias, Sunhae Im didn’t so much command attention as deflect it towards the front desk of wind soloists. Even when standing out from her chorus place, she is a physically poised but understated presence, uneven in projection of both tone and words. Singing the words of Christ within the chorus line, Johannes Weiser looked and sounded uncomfortably cramped, far more assured when commanding the space of the stage in the arias, even if ‘Mein teurer Heiland’ was disconcertingly business-like. The single still point of reflection within the body of the work – convincingly enough – was ‘Es ist Vollbracht’, projected front and centre stage by Christoph Dumaux as a lamento in the tradition of Monteverdi with a direct appeal to our sympathy that Jacobs himself would have been pleased to achieve in his countertenor days. In the turba choruses, however, ‘Schreibe nicht’ typified how pitting singers and instrumentalists across the stage from each other muddied the overall sound coming out towards the audience. 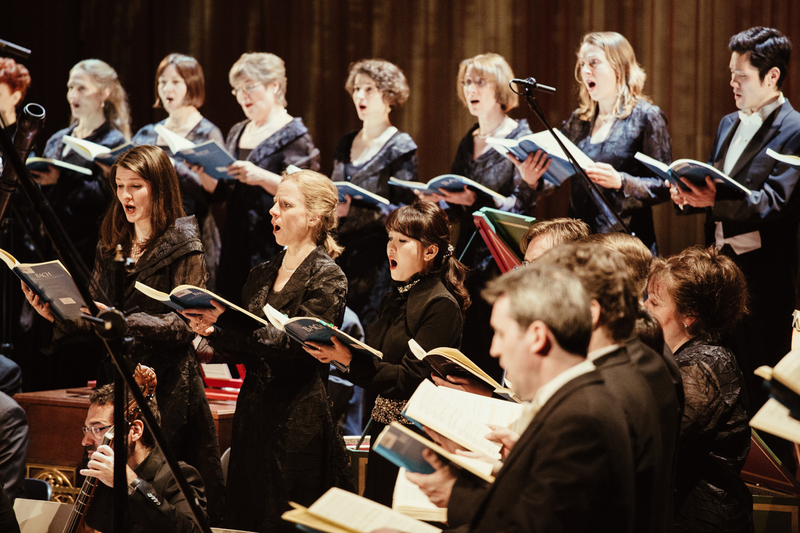 All the same, the concertante effect of ‘Lasset uns den nicht zerteilen’ – Bach the contrapuntal showman – made a simply dazzling effect, solo and crowd voices of singers and instruments talking to and over each other, a moment when it all clicked. So, satisfyingly, was the final chorale, in which every musician on stage took part, even the Evangelist. Simply done, warmly sung with a long and lovely fermata, no defiance or celebration, the Passion came to rest. Posted on April 4, 2015 April 4, 2015 by Peter Quantrill	This entry was tagged Bach, Jacobs, Misteria Paschalia, St John Passion. Bookmark the permalink.